Mr. #45 Donald Trump, 'Shithole' Countries Not A Priority. You are here: Home / News / Mr. #45 Donald Trump, ‘Shithole’ Countries Not A Priority. Mr. #45 Donald Trump, ‘Shithole’ Countries Not A Priority. (ThyBlackMan.com) Our 45th President has traipsed over to the World Economic Forum in Davos, Switzerland, planning to rub elbows with world leaders, repair some relationships, and possibly shred even more. He had hardly landed before he started threatening to cut off aid to the Palestinians unless they participate in peace talks with Israeli Prime Minister Benjamin Netanyahu. Palestinian leaders are justifiably angry that 45, without a conversation with them, said he would move the US Embassy to Jerusalem, the city that both Palestinian and Israelis consider their capital. Since 45 has been President, the world has been losing respect for us. According to a November Gallup poll, approval of US leaders among 134 countries has hit a new low of 30 percent, down 18 percent from the 48 percent approval rate in President Obama’s last year, and even lower than the previous low of 34 percent in George W. Bush’s last year. Only Liberia, Macedonia, Israel and Belarus increased their approval rating of the US, while Portugal, Norway, Belgium and Canada saw approval ratings plunge by 40 points or more. 45 has been currying Israel’s favor, so it is no wonder that they are more approving of him. But US leadership lags behind support for leadership in both Germany and China. Only Russia has a lower approval rating than we do. Meanwhile, 45 is ignoring most of the rest of the world. A year into his Presidency, he has not appointed ambassadors for fully half of the world. The Bureau of African Affairs, part of the State Department, has no leader. There is an “acting” Assistant Secretary for African Affairs, Donald Yamamoto, a career foreign policy professional who has worked for both Presidents Bush and Obama. Yamamoto has some responsibility for the Bureau of African Affairs, but it is not his priority. There is no ambassador to the African Union, which is perhaps a blessing because that person may have had to defend 45’s ignorant remark about s***hole countries. But 45 didn’t have to make such an ignorant statement in order for us to know how he felt about people of African descent. He illustrates his disdain every time he opens his mouth. He did not have to compare Haiti to Norway, all he had to do was fail to appoint an ambassador to Brazil, which is home to the largest population of Afrodescendents outside the African continent. There is no US ambassador to Belize, Bolivia, Burkina Faso or Cape Verde. No ambassador to Cote D’Ivorie or Cuba, Guinea or Ghana, Jamaica or Kenya. Neither Madagascar nor Mali, Mozambique nor Nigeria, South Africa nor Tanzania, Togo nor Trinidad have US Ambassadors. Blessedly, 40 percent of 45’s appointees are career foreign policy experts. Some, like Calista Gingrich’s appointment as Ambassador to the Vatican, are clearly political plums. 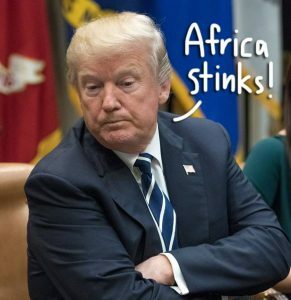 But how can 45 justify having no ambassadors to two of the most important countries on the African continent, oil-producing Nigeria, and economically advanced South Africa? I guess he will be forced to pay attention to these s***hole countries if there is an oil crisis and we need some Nigerian oil! Africa and the Caribbean are not the only parts of the world that have been ignored by this administration. Highly desirable appointments, like those to Canada, France, the United Kingdom, and Germany have been filled. Even as 45 has squabbled with North Korea’s Kim Jong-un, he has appointed no ambassador to South Korea. This could have been completely avoided if 45 had allowed Obama appointees to stay in place until he found people to replace them. Instead, people had to come home in the middle of the school year, hurriedly making arrangements for new schools, new housing (some had rented their homes), and more. Why did 45 demand resignations so abruptly when he had few replacements, breaking precedent and also thumbing his nose at the world? Our NATO allies look askance at him because of his obnoxious and belligerent behavior. He has made strange remarks about terrorism in the UK, taken swipes at France and Germany, and generally behaved like an overgrown child when gathering with other world leaders, pushing the Prime Minister of Montenegro aside so he could get in front of a group photo at a NATO summit in May. Incidentally, there is no US Ambassador to Montenegro. Actually, staffing the government is not a priority of this administration. When he was elected, he indicated that he thought some agencies were “huuuuge”, and there were positions he would not fill. He has been much slower than his predecessors in staffing up every agency, but especially the State Department. By the end of their first calendar year (2001 for Bush, 2009 for Obama), Bush had 139 State Department confirmations, with 14 pending. Obama had 119 confirmed and 18 pending. 45 has 61 confirmed and 28 pending! We who are connected to s***hole countries can rest assured that foreign policy is not this administration’s strong suit. 45’s failure to appoint ambassadors to African countries perhaps reflects the disdain he feels for us. But his disdain is yet another reflection of his ignorance.